So you’ve made the switch to rid yourself of cooking bland food. As you know, your pellet grill runs on the burning of hardwood pellets for fuel. But, with tons of different pellet brands, flavors, and mixtures on the market it can be confusing deciding which blend works best with your food. As a general rule of thumb, mild flavors will work best with delicate food, while robust flavors will pair well with heartier foods. Your personal taste preference plays a large role when deciding on flavors to infuse your cooking with. Once you get more comfortable with your pellet grill try blending your own pellet flavors together for a perfectly personalized taste. All wood pellets are not created equal. When comparing brands you want to look for companies than can offer a true wood flavor by using all natural hardwood, no additives, artificial flavors, binders, spray scents, fillers, or chemicals—100% pure hardwood. Simplicity is key, find companies that don’t tamper with Mother Nature’s formula and who can provide pellets that offer more than just a heat source. We recommend Camp Chef’s 100% Premium Hardwood Pellets. They have over eight award winning flavors that can compliment any cooking concoction – including two new Charwood Charcoal Blends. Bags are 20 pounds—a 24-inch pellet grill will typically burn 3-pounds per hour. Here’s a short breakdown of what your food would pair well with! 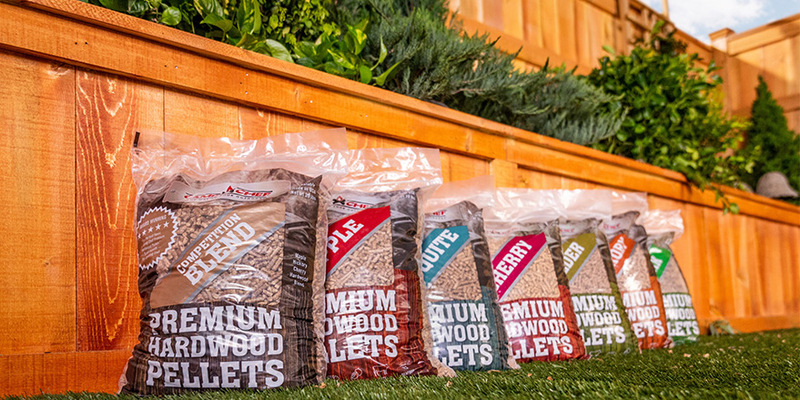 What Hardwood Pellets will you be using this weekend? Do you have any secret flavor concoctions you love? Let us know in the comment section below!